AR School has a magic card app. I was expecting a small sample of a free product for this review, and was surprised when a treasure box was delivered to my door. 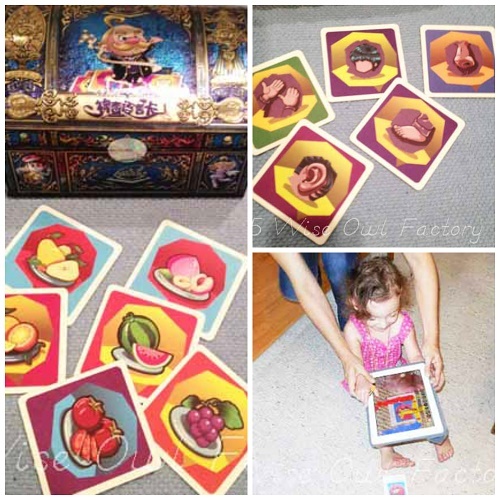 The treasure box helps to teach eight languages. Before I agreed to review this educational product, I checked out a free trial which I used with a free iTunes app. Being impressed, I then watched this video. I was sold, so to speak. No pun intended. Language is a treasure this active learning product is a too as it supports eight languages including English, Chinese, French, German, Spanish, Russian, Japanese, and Korean. Some of the directions are in Chinese which stumped me at first, but the pictorial helpful directions and included English page made it easy to figure out. Hey, you know the kids can take to this like ducks to water, anyway. This product works with iOS and Android. This is a wonderful product for multilingual families, children, and educational setting such as classrooms and after school programs. I rarely do product reviews but this one really caught my attention as different members of our family have spoken or learned several languages. When we lived in the Netherlands, my children would watch Sesame Street in 4 languages and I always think we are missing the boat to not be playing these programs in the USA. They were hearing several languages there, also, as the Dutch are multilingual. My children were counting and saying the alphabet in 4 languages just by being exposed to all this learning. Young children are such sponges for learning languages and before age 10 is when such learning is natural. I love these cards as they remind me of the language learning that is possible by the young! So augmented reality cards look like memory game cards (and have passed safety standards) but when used in conjunction with an app 3D cartoon images pop up that speak. The words can be read in 8 languages by pushing buttons at the bottom of the iPad screen. See this video for a little view of how they work. This was the first time this person used the app and kindly allowed me to video tape. Note to self: turn iPhone when taping to capture the whole window. We also tried this with a young bilingual visitor to our home who speaks French and English, having a mother from France. 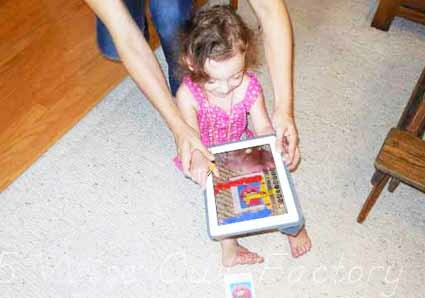 It was a joy to watch her engage with the app! Not only are there vocabulary cards, some cards have short questions and answers dialogue. Additionally, there are several categories so the cards can be sorted. Transportation, food, the 5 senses, and several other categories are included. If a child isn’t sure of a word, he or she can use the app to check what it is. When new English Language Learners (ESL or ELL) are assigned to a classroom who know little English, this would be a perfect opportunity for the children to learn in English and perhaps work with classmates who could learn words in another language. Two languages dictionaries would also work, but a new student who had these cards would be able to “play” with other children immediately. It would help assimilation into class and with meeting new friends. It would be so welcoming! We have a daughter who was adopted from Korea, and I know this would have been wonderful for her when she was younger. My children learned the different languages faster than I did in the Netherlands, and I could have used this myself! Where was Augmented Reality when I needed it? My daughter has since learned German and traveled to Germany. My son has learned French and traveled to France. Other family members speak a variety of language including Spanish. These cards are such a fun way to share vocabulary and learning. Maybe I can remember some of the French I learned in school, too. I feel knowing other languages is so important. We will certainly be using this product. 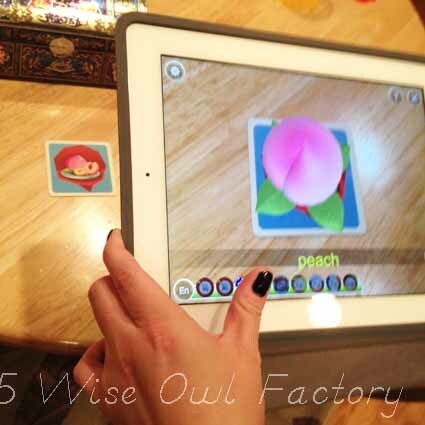 AR Magic Cards are new type of interactive educational product special designed to be used with mobile devices such as cell phone or tablet for convenience. I already mentioned the app is free on iTunes. If you have more questions, this page is jam packed with information and even a FAQ section. Version II has more cards and games. 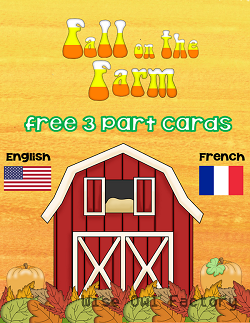 I almost always make a free printable for my posts, but today I am going to share a farm 3-part cards French and English PDF from last fall. It is fall again and it would be a good time to use this printable, and it is bilingual. Download the PDF at this blog post.